all go to make Angkor Village one of the most romantic, friendly places to stay in Indo-China. offer all the comforts of Angkor Village Hotel for the budget conscious travelers. Deluxe rooms: 40 sqm, have scenic views overlooking lotus ponds and gardens. Traditional furniture, local arts and crafts gives them a warm, comfortable and authentic atmosphere. L’ Auberge des temples - In the romantic setting of dining room, fanned by the breeze from delightful lotus ponds, discover the authentic Khmer culinary traditions, prepared with fresh local ingredients. Apsara theatre - Step back in time at the only air conditioned theatre in town. a culinary journey through the region, with Khmer, Lao, Thai and Vietnamese fine dishes. 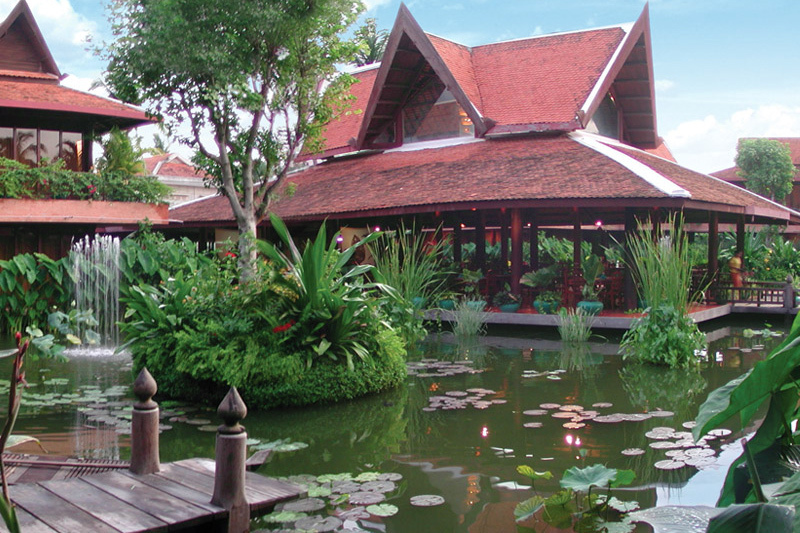 Angkor Village Hotel is ideally located in the heart of Siem Reap. All rates shown are per room per night, exclusive of bank fees.